Left to right: Dr. Renee Middleton Dean of the Patton College of Education, Jeff Stricklett Superintendent of Schools Washington-Nile Local School District, Linda Tieman Vocal Music Director Portsmouth West High School, and Paolo DeMaria Superintendent of Public Instruction the Ohio Department of Education. So many of our teachers work above and beyond of is asked of them, while never expecting much in return for that extra time spent. 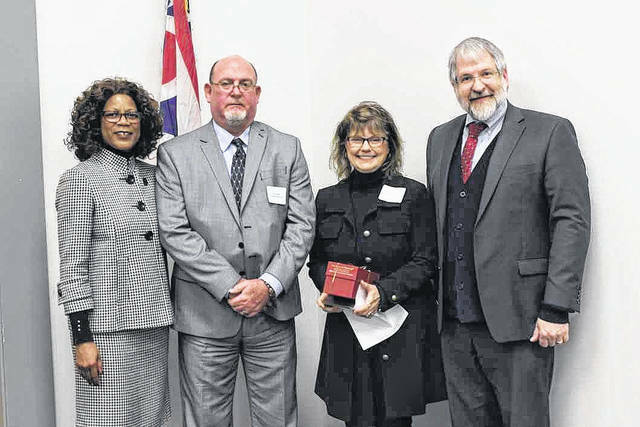 It is nice to see one of our local teachers, Linda Tieman from West High School receive an award, for all that she does both during class time and other times. On Wednesday, January 24, the Coalition of Rural and Appalachian Schools recognized Outstanding teachers across our region. Linda Tieman, high school vocal music director at Portsmouth West High School was recognized. The following individuals were in attendance for the recognition, Dr. Renee Middleton Dean of the Patton College of Education, Jeff Stricklett Superintendent of Schools Washington-Nile Local School District, and Paolo DeMaria Superintendent of Public Instruction the Ohio Department of Education. One of Tieman’s former students, Jon Runions, a teacher at Waverly Middle School, was also recognized as an outstanding teacher. Tieman is well-know around the community for things she does or helps with, but when speaking with her, one finds, she doesn’t like to ‘toot her horn’ much, However, she says, “I’m very passionate about working with The Breast Cancer Compassion Fund when it first started, for personal reasons, I just thought it was a great cause. Actually, the senior class that year, started support for it and we did fundraisers for it here at school, then about every four years, we do a major review, which is a fundraiser for it also, and we’ve raised quite a bit of money to support that cause.” She added, “Just recently, the kids have become involved with the Greenlawn project and helped and sang at their fall event at the cemetery. After speaking with Linda Tieman, one can see that she truly cares about her students and her community and that this award was well deserved and shows just how much she as an Outstanding teacher, reaches out above and beyond in all she does.